(c) 2014 Lisa Sierra Licensed to About.com Inc.
Turrón, almond nougat candy is the most popular and traditional Christmas sweet in Spain. This Turrón ice cream recipe uses both the two traditional soft and hard varieties of turrón to create a spectacular summer dessert that is truly simple to make. It is also a great way to use turrón left from Christmas! Cut soft turrón into one inch cubes. Scoop ice cream into blender. Add whipping cream and turrón. Pulse blender on and off until the turrón is completely blended into the ice cream. Pour the ice cream mixture into a 9” x 12” glass baking dish and spread evenly. Cover tightly with plastic wrap and place in freezer. 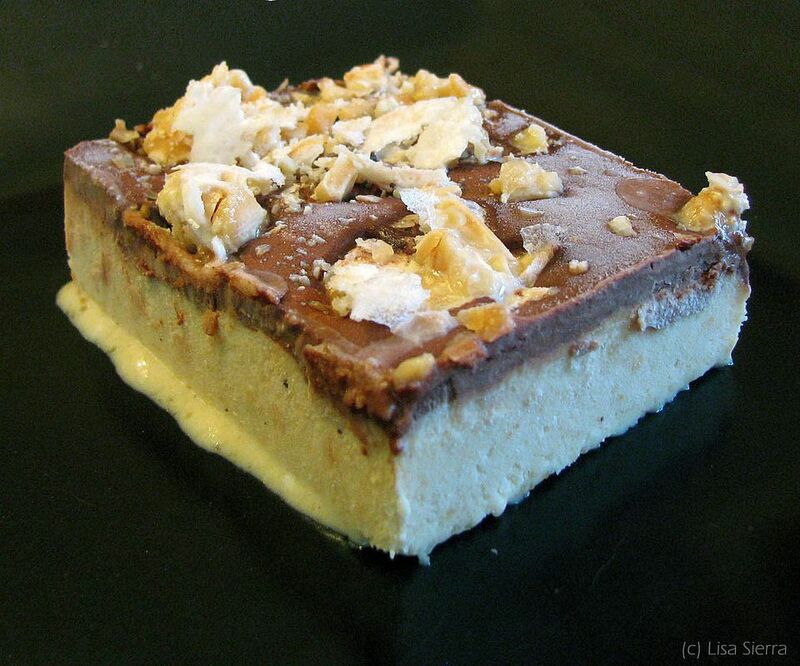 Break hard turrón into pieces and place in food processor. Pulse on and off until turrón is broken into smaller pieces. The turrón should not be processed too much but should be small chunks. Remove ice cream mixture from freezer and pour chocolate sauce over the top, spreading it to the edges with a wooden spoon if necessary. Sprinkle crushed turrón over the top. Freeze for at least 3 hours, until ice cream has hardened. When ready to serve, remove from freezer for 5 minutes before cutting. Cut into squares to serve.